Perfect for shopping, cycling holidays for transporting luggage, trips with the kids or picnics with friends! Bike trailers are perfect for anyone who's favorite means of transport is their bike. Well-designed trailers should be aerodynamic so as not to impair handling too much. A bike trailer's features depend on its area of use. If you want to take your kids out and about with you, but they're too young to ride themselves, then a child trailer is a great idea. These are comfortably padded and have safety features such as safety belts, baby seats with seat inserts and roll bars. The weekly shop can be very impractical if you don't have access to a car, the racks on your bike alone are simply not enough. Heavy, bulky items such as drinks crates can be placed safely and securely in a bike trailer with sufficient carrying capacity. Good models can be converted for different uses in a few simple steps. For example, by removing the backrest and the hood, a child trailer can become a transport trailer. There are even special dog trailers for all you dog lovers out there, so your four-legged friend can come along for the ride. Just like a car, a trailer is a long-term investment. So you want a trailer that is reliable and easy to repair. 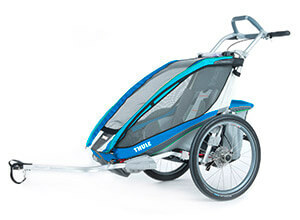 Finding replacement parts for high-quality models from brand name manufacturers such as Thule is no problem at all. This is a real advantage when it comes to replacing wear parts. With bicycle trailers as with other bicycle accessories, if you buy cheap, you should expect to buy twice. Or you can expect to get frustrated when your trailer goes walkabouts because of a lack of practical features such as a parking brake. A trailer's tow bar attaches to either the seat post or the rear hub. A trailer attached to the hub tends to bounce around less and does not exert as much force on the frame. Optional accessories such as additional wheels can turn a child trailer into a buggy which can be pushed along without the need for a bike. A model with adjustable suspension is recommended to improve the ride when transporting varying loads. Robust spoke wheels come as standard. As well as an axle, a bike trailer should also come with a push handle. This allows you to wheel your shopping all the way to the front door as if the trailer were a regular shopping cart. In addition to the standard features, safety features like reflective elements on the trailer itself and on the wheels and a safety flag on the back of the bike are also a good idea.